Thaw your puff pastry according to directions. Preheat your oven to 400 degrees. Drizzle 1 Tablespoon olive oil onto a medium sheet tray. Lay out carrots onto the sheet tray so they are not touching. Place tray of carrots on middle rack of oven and roast for 7 Minutes. 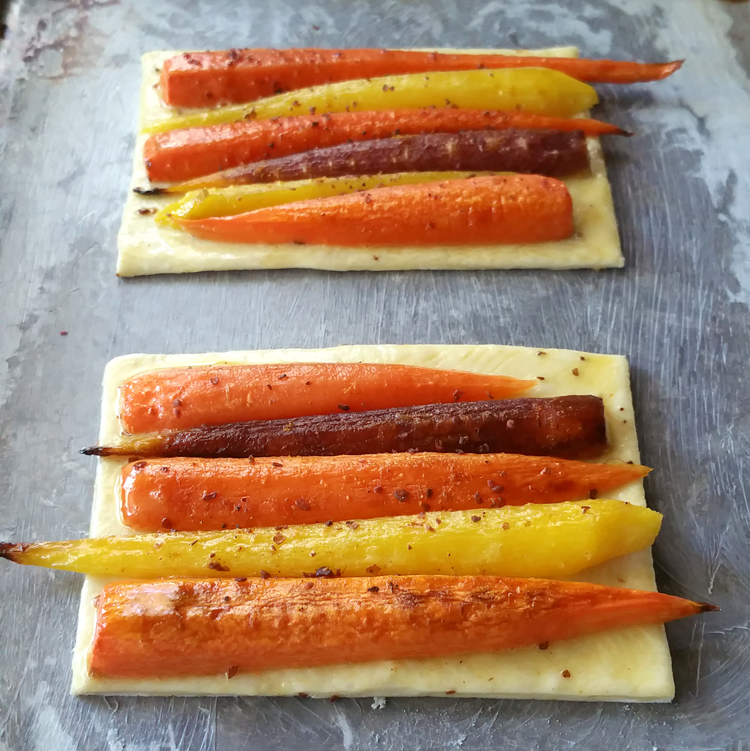 Open oven, remove tray and flip carrots over to cook evenly. Return tray to oven and allow to cook for an additional 7 minutes. 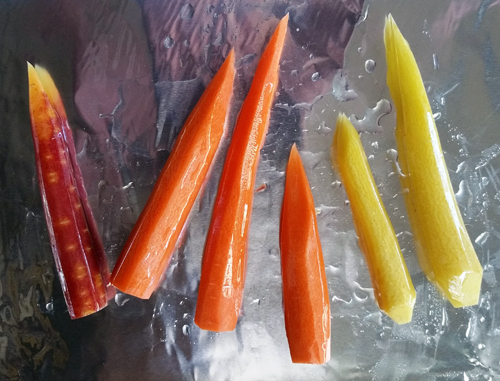 Remove carrots from oven and allow to cool. When carrots are cool. Place them onto a cutting board and cut them in half. Then, place your puff pastry sheets onto a baking sheet so they are not touching, as seen below. Top the sheet with the carrots cut side facing down. Sprinkle sumac and salt over carrots to season. 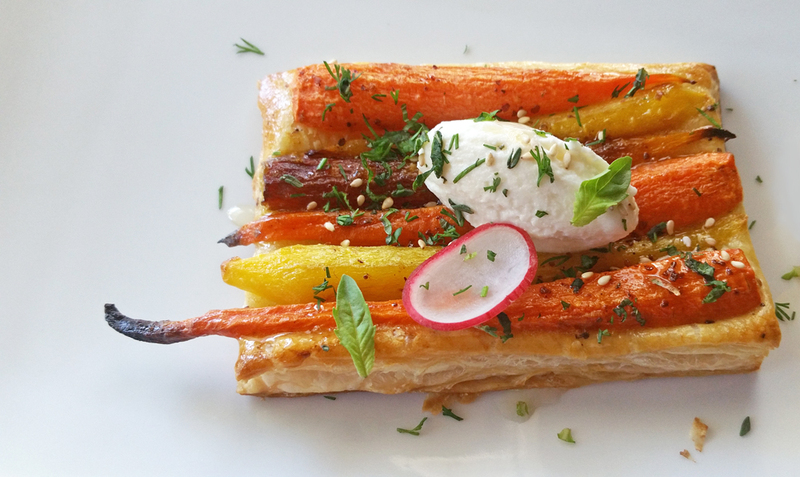 With a clean basting brush, distruubute an even layer of egg wash over the visible puff pastry. The egg wash provides a nice color and sheen to the pastry. When finishing applying the egg wash, you're ready to pop these in the oven. Just like the carrots they should be cooked on the middle rack of a 400 degree oven. Bake these pastry's for 15 minutes until the edges are golden brown and the pastry is fully cooked. Remove pastrys from oven and allow to cool for 2 minutes. Serve with a scoop of ricotta, honey, sesame seeds and herbs. You can eat this with your hands or with a knife and fork. 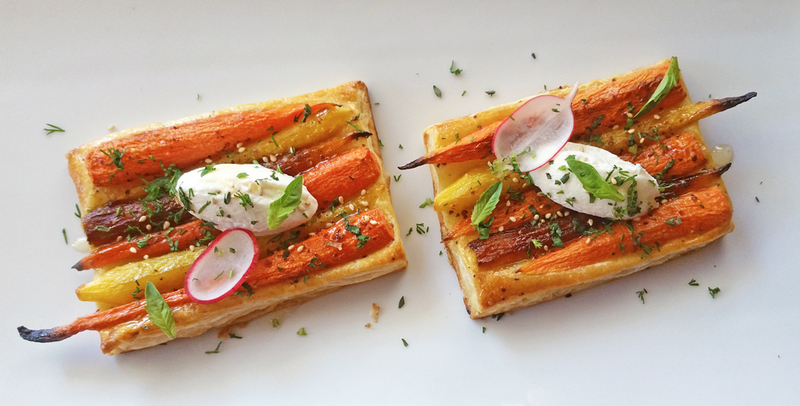 Also, if you are making a large amount of these, you coudl sue the same recipe for whole sheets of carrot tarts. Just make an entire sheets and cut into the serving size you or your guest desire. All Summer long I was in search of a fully loaded Bloody Mary and yeilded pretty mediocre results. So I decided to take things into my own hands and create my own. Behold! My version of a Loaded Bloody Mary! Full of everything I love to eat (and drink) this is a sure hit at any Sunday football party or brunch date. You can even create a bloody mary bar with all of the ingredients layed out for your guests to choose from. Have fun creating, eating and drinking yours! Place all Bloody Mary Ingredients into a large pitcher, whisk to combine. Cover with lid or saran wrap and allow to chill in the refrigerator for a minimum of 1 hour and a maximum of 24 hours. When ready to serve, stir Bloody Mary mixture again to distribute even flavors. Fill 10 16oz. mason jars halfway with ice cubes. Pour 3oz. of Vodka and 6 oz. of Bloody Mary mix into each glass and stir with a cocktail stirrer to combine flavors. 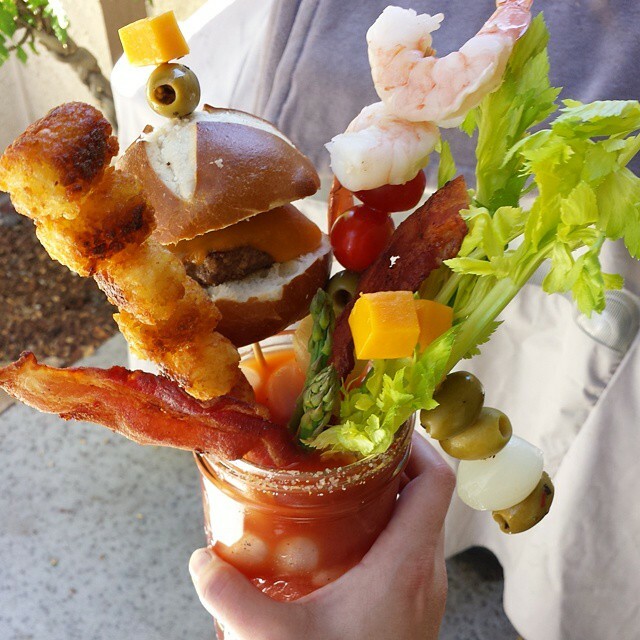 Garnish with your choice of garnish options, basically anything you can put onto a skewer you can put into your loaded bloody mary. Celery Stalks, Olives, Bacon and Shrimp are my favorites. Enjoy! *Disclaimer: These Bloody Marry's are large and in charge. Please drink responsibly. 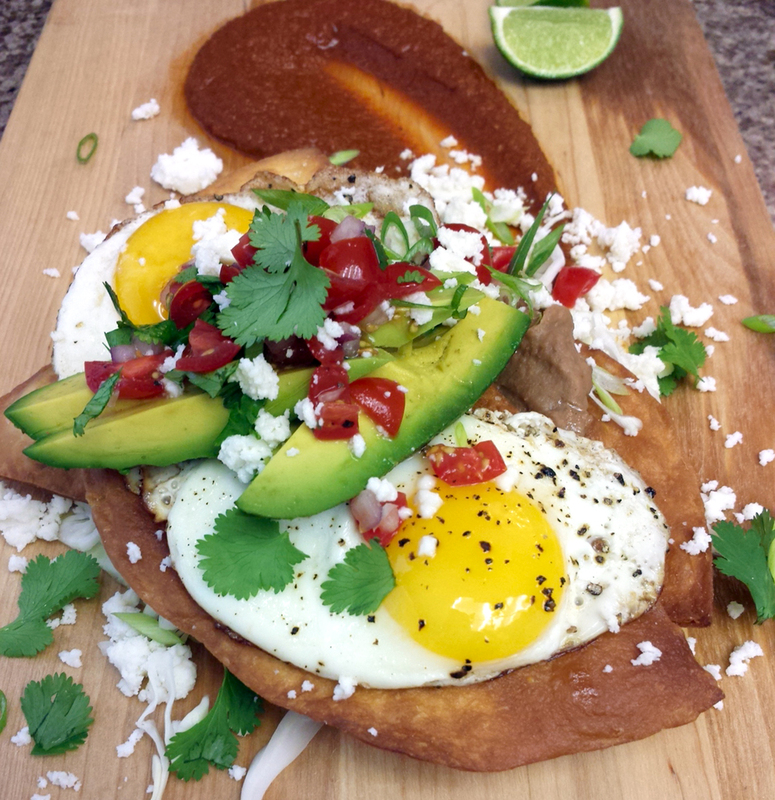 This morning I got a late start to the day and decided to spend my afternoon creating my ideal huevos rancheros. This sauce is made from a few simple ingredients and produce you may already have in the house. On a spicy scale of 1-10 this sauce ranks a 7 or so. If you like a little less heat, leave out half of the jalapenos. Heat olive oil in a medium stockpot over high heat. Add Onion, Carrot, Celery, Jalapenos, Garlic Cloves, Cumin, Chile Powder and Crushed Chiles. Saute over medium heat for 3 minutes until soft. Add tomato paste,and stir with vegetables for 3 miinutes or so with a wooden spoon. Add chicken stock, stir and bring mixture to a boil. Simmer over medium heat for 15 minutes. Then blend mixture with an immersion blender and season with salt and pepper to taste. Serve under, or over, sunnyside up eggs and a fried tortilla! This dish is best cooked in a cast-iron skillet. If you don’t have any cast-iron cookware, a large stainless steel sauté pan would work just as well. Heat a medium cast-iron skillet over medium-high heat and add chopped bacon. 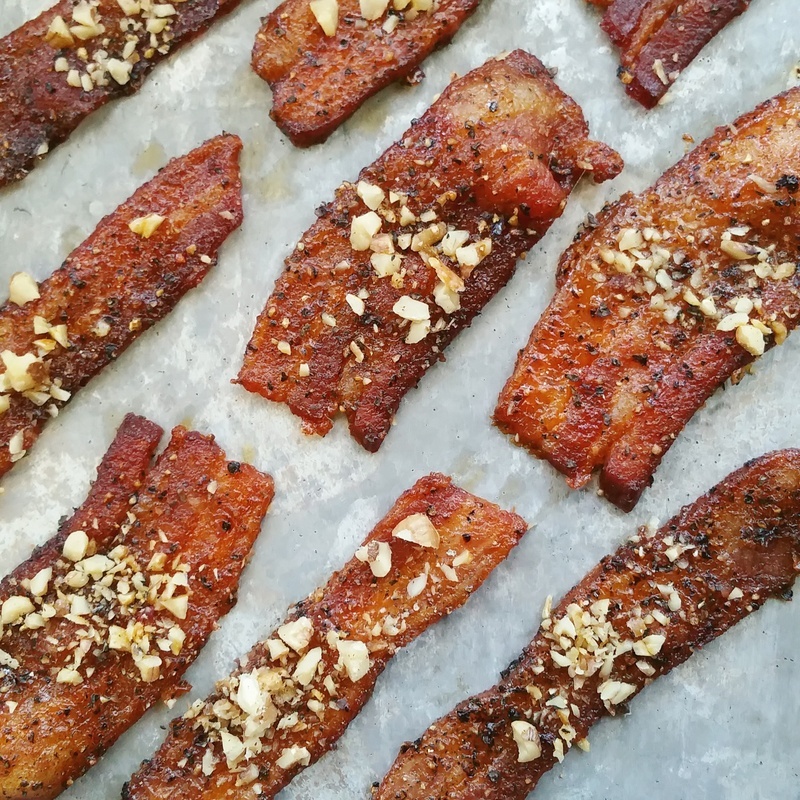 Stir with a wooden spoon until bacon is cooked. Remove bacon from pan but leave the fat. Return pan to stovetop and heat over medium-high heat. 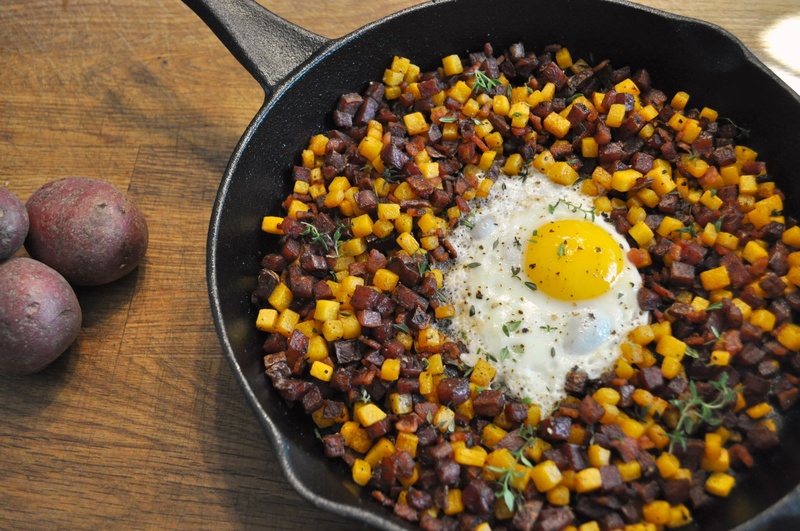 Add potatoes, butternut squash and thyme to the pan and continue cooking over medium heat for 10 minutes, stirring every 2 minutes to evenly cook the hash. Be sure to season the hash as well with a light sprinkling of salt and pepper. With a spatula or spoon, make an opening in the middle of the pan for eggs and reduce heat to medium. Melt butter onto open spot and crack eggs into pan. Reduce heat to medium low and continue cooking until egg whites are firm and potatoes are cooked through. Garnish with chopped parsley and/or thyme. 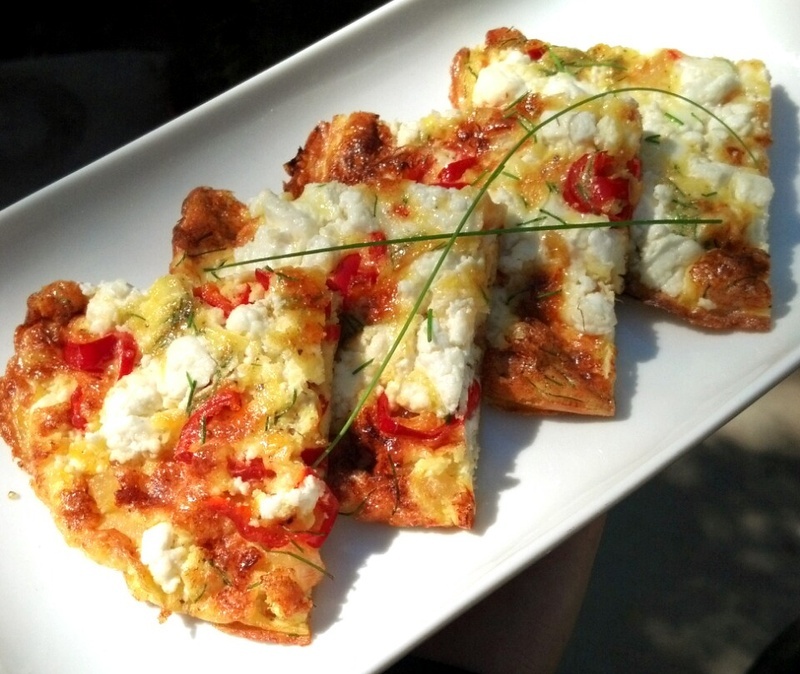 This goat cheese and red pepper frittata can be made in under ten minutes! A quick, sophisticated and healthy breakfast or lunch for anyone on the go. Can be served hot or chilled. Postition cooking rack in upper third of your oven and preheat broiler. Whisk eggs and half-and-half in small mixing bowl until incorporated. Heat oil over high heat in medium, oven-safe, non-stick skillet. Add peppers and 1 tablespoon scallions, stir and cook for 1 minute. Add egg mixture over peppers and scallion. Allow eggs to cook for 30 seconds, then carefully lift edges of frittata allow uncooked egg to flow underneath. Cook 2 more minutes or so until bottom is light golden brown then remove from heat. Evenly add crumbled goat cheese to top of frittata and place skillet on upper rack of oven. Allow to cook for 2 to 3 minutes or so until egg mixture has puffed up and the top has become golden brown. Remove from pan, allow to cool for 1 minute. Slice frittata into quarters and garnish with chopped scallion or chive.